The Family Spirit – from a humble ‘House Distillery’ to an enterprise of international reputation – that’s the remarkable success story of the Schladerer Company in Staufen – Black Forest – Southern Germany still run by the family. Quality is the most important aim of the company, which has achieved World Wide recognition over 150 years since the days, Sixtus Schalderer bought the ‘Gaesthaus’ named ‘Kreuz – Post’ including the distillery and the licence in 1844. In 1922 Alfred Schladerer closed the Restaurant and extended the distillery as well as the winery. In 1930 Liqueurs were produced and in 1938 the so called ‘4 Corner Bottle’ was designed and later registered. During the war, jam was produced to help the company to survive, Schladerer Himbeergeist was sold in Switzerland in 1951 and various distinctions achieved. From 1954 onwards Schladerer, crew World Wide and Alfred Schaderer died in 1956 and his wife carried on running the business. In 1957 Schladerer Williams Pear was created and became one of the most important product in the Schladerer range. Greta Schladerer died in 1987 when her adopted son Nicolaus Schladerer – Ulmann took over. RI – Wine of Ascot is selling the Schladerer products since 1998 and over the last few years also successful via the Internet as far as Japan and the USA. The flavours contained i this lovely Miniature Gift Box are: Raspberry, Williams Pear, Cherry, Yellow Plum, Blue Plum and Apricot. 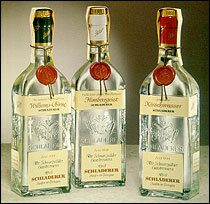 All Bottles (Schnapps)are 70 cl size. All Bottles (Liqueur) are 50 cl size.